By Raleigh-Elizabeth. Images by Steve Albert via Home DIY. It’s hard not to feel like you’re behind when you look at Martha Stewart’s monthly calendar in the first few pages of Living. No, Martha, I haven’t cleaned my gutters, defrosted my fridge (have I ever? ), or chilled with my ponies this month. I don’t even have ponies. But I also haven’t started getting seedlings ready for my garden, either. Every time I think about it, my brain shuts down. Garden? What garden! It’s freezing out! But freezing or not, Martha’s right: it is time to start planning. As a cook, there’s nothing more empowering than having control over your ingredients. And there’s no better way to ensure their greatness than having grown them yourself. From broccoli to squash blossoms, growing an edible garden is not only a great way to connect with your food, it’s also a fun way to reduce your monthly produce bill. Creating an edible garden is something you can do anywhere. For years, I grew herbs, fruits, and vegetables in the two windowsills of my postage-stamp sized New York City apartment. Now, we go whole hog on a half acre of loamy land and a shady front porch. From April until November, we have fresh veggies on hand. There’s something about a plant you grew yourself that just tastes better on a plate. To get started, take a little time to know before you grow. What grows well in your region? How do you get started? Marta Teecan is a trained chef turned kitchen gardener, and her book, Homegrown, can help you get your garden plans off the ground. (It’s also just a really nice read!) I like to have a regional planting guide on hand, too, just so that I avoid any rookie farmer pitfalls. Ask your local nursery if they can recommend a good one — they usually know the best guide for the area. Next, you’ll want to figure out where you’re going to garden. I like to use our back yard, away from where the dogs play, but I also grow lettuce in the shade of our covered front porch and herbs and potted fruits on the back porch. Granted, as a partial garden, my front door doesn’t welcome you with anything as pretty as twisty-topiaries, but there’s something charming about a guest entering your home near a bed of arugula that will soon become their dinner salad. 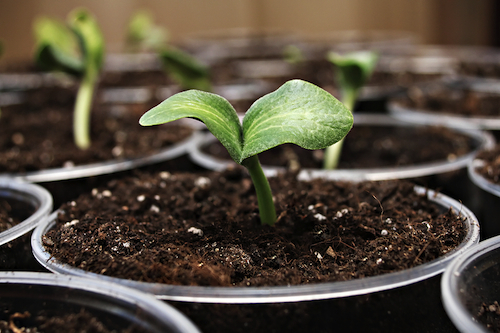 After you’ve worked out the basics and mapped out your garden, determine your seedling growing schedule. No matter where you are, it’s probably time to get a jump start on your veggies. This temperature chart for when to start your seeds is really helpful. Starting seeds is a fun activity, and it’s great to do with kids! There are a lot of clever ways to start seeds, too. I’m partial to planting my seeds in eggshells, which are easy to label and a great source of calcium for the plant, but you can also use ice cream cones or create your own mini-green house. It’ll be awhile yet before they go outside, so come up with a plan for where they can live in the meantime that works well with your home (and the two and four legged traffic therein). As the seeds start to grow, you’ll have plenty of time to work out the rest of the details (like tilling the soil and finding a super cute gardening apron). But taking a few minutes this time of year to sit down and plan for the summer will yield a delicious bounty in just a few months. Plus, garden planning can legitimately include salivating over the Agrarian collection from Williams Sonoma (and dreaming of owning your own chickens who would, of course, live in an Architectural Digest-worthy chicken coop), which is never a bad way to spend an afternoon. I have no big dreams of micro-farming an organically perfect crop like Martha probably does, but I do love keeping an edible garden that sustains us with fruits, vegetables, and herbs throughout the year. Last year, we nursed to life four different kinds of corn, a variety of lettuce, more tomatoes than I can name (all of them delicious), peppers, broccoli, brussels sprouts, peas, beans, lemons, strawberries, and all manner of herbs. And for all that bounty, I can thank a little careful planning when it was still freezing cold out. Even if I always fail to do it on Martha’s schedule. Maybe. I could just start with spinach and work my way up. you may have just saved us from an unfortunate chicken experience. bill, my husband, jokes that i’ve made them seem like a totally reasonable request since my newest pet-crave is a penguin (we don’t need to get into the legalities of that, i also can’t have my pet unicorn). but if you’re going to start small – can i recommend something super easy like arugula? or brussels? those you leave alone and completely forget you planted and then ta-da, they somehow survived your dogs, little children, some alligators (in our case), and general neglect. very hardy! Plant it and forget it sounds perfect – thanks for the recommendations! This post is coming just in time! We moved in the country last summer and a few days ago I started reading about seeds and vegetables. I got excited and started a big list of vegetables I want to grow but now I am thinking that maybe I should start slower since I am a beginner. It is very tempting though and when you start thinking about your own edible garden you want tomatoes and cucumbers and beans and water melons and zucchinis and aubergines and peppers…. hooray! my advice: seed everything. some seeds just won’t turn out like you’d like. so give them all an equal opportunity for growth – and plant those that come in well! keep us updated on the progress! would love to hear! Just a few days ago I put in my seed order for 10 different heirloom tomatoes and various other veggies. I love the idea of planting them in egg shells though. I will definitely do that this year. Do you just plant the plant with shell and all? We have a great edible garden that feeds us various produce from June until October (actually ends up feeding the whole neighbourhood). All winter I dream and sketch what will go where and what new plants I can try (the more colourful the better). My kids favorite garden snack? Nasturtium flowers. This morning I found a site that ships out boxes full of live ladybugs to protect your garden from pesky insects. Do you have any experience with that? LADYBUGS! I hadn’t even thought of that. We have a very pesky kudzu bug problem (they’re like very tiny stink bugs that fly en masse – yick) and what HAD been an organic garden got the serious chemical treatment when nothing we did got rid of them. Finally, though, they just moved on. We do heirloom seeds, too, which can be so tricky – but I always order from Baker Creek and we’ve had pretty good luck with them. As for planting in the egg shell – yes, you plant the seed DIRECTLY in the shell. I crack the shell a little when I plant it, just to make it easy for the roots to grow out, but it goes in eggshell and all, and it’s a very easy way to keep it labeled and stored during the seedling cycle. Plus, they provide great calcium for the plants once they are in the ground! My son has used hungry ladybugs for years. Put the box in the fridge for a bit until you’re sure that they’re very hungry. Bye bye pests. We have tried to grow veggies in the past, but never had great success. I think that I get overwhelmed by all the watering, as it doesn’t rain much in the summer here! I always have a big herb garden though and love having those on hand to cook with. This year, we are adopting a two year old and my husband will be on paternity leave for most of the summer, so I’m thinking about trying a small vegetable garden as a fun family project, since we’ll be home a lot. This post has inspired me to start jotting down some ideas today! We *just* started our seeds last night! I’m hoping they’ll be good to transplant by the end of March (freezing season ends here mid March). I’m always good with veggies, but man, somehow, I end up killing herbs. Any recommendations would be super welcome, haha. Have you tried rosemary? My experience with it is that no matter what I do, it and thyme grow wild. I also put nursery nannies in my herb planters – have you tried those? What are “nursery nannies”? Never heard of them before, and Google turned up nothing. Very inspirational blog. Wow, Mari! How incredible! Y’all have done so much! And I’d give yourself a by on getting everything started on time – I’m 7 months, and I’m still dragging. I think we might be a bit smaller than normal this year, but truthfully, I’m not sure I’ll have the time to tend the garden as much anyway! And CONGRATULATIONS! I do have an edible garden. Last summer, I grew tomatoes, tromboncino squash, and herbs. I have a winter garden at present with kale, carrots, broccoli and brussels sprouts, but it’s not doing very well. The broccoli has bolted and something in the garden is enjoying the kale before we can get to it! I’ve already started my seedlings for the spring/summer garden which will include an expanded herb/medicinal bed and more veggies. And I’m hoping my strawberries will do better this year than last when I only got a few. You know, Dee, I actually heard that last year wasn’t a great year for strawberries. (We’ll just ignore any geographical significance of that and keep it as a “blanket statement.”) So, definitely not you! Better luck this year : ) And tell those rabbits to stay away from the kale! Mister McGreggor and all. Okay, I’m doing this. Especially after reading Amy’s post on perfectionism. (I haven’t started a garden because I need to figure out how to do it “right.”) But I know it would a great experience for my kids! We’ve grown pumpkins successfully for a few years, but it’s time to branch out into a few of our favorites: watermelons, broccoli, tomatoes, beans, and herbs. I love your eggshell idea. We’re renters but are fortunate enough to have fantastic landlords who let us transform half of our urban front yard into an edible garden – so we currently have three raised beds and our building a fourth! We’re also lucky enough to have a covered porch that does a great job as a greenhouse! Next week. we’re building the fourth bed and prepping the beds for our next planting and in two weeks, we’ll start planting! Adina, that’s so exciting! And your garden looks beautiful! I have found rosemary, thyme, sage and oregano to do well in pots on the deck or planted in the ground in Seattle.They require minimal effort and I save a lot of money not having to go buy fresh herbs all the time. Green (spring) onions were another one that did surprisingly well in Seattle – you just cut them off near the soil and they’ll regrow for another use! Chives are a favorite of mine, easily grown, and come in a variety of flavors other than the standard onion. A couple of my favorites..garlic chives and lemon chives can really enhance soups, salads, omlettes etc. If you haven’t thought of it, many herbs are also used to make decaff teas. Bay leaves fresh or dry can be used in your pantry to discourage insects from making it their home. Just remember to frequently harvest to keep up their production. The surplus may be dried or dehydrated and then put into fancy small sterile glass containers for gifts or even vacuum packed like freezer pops, put a holiday sticker tag on individual content or blend. Oh, I love this! The perfectionist in me has been delaying for one reason or another – not enough sun on our windowsills (and only windowsills!) but now I feel inspired. Gabrielle, would you please share which types of fruits and vegetables you were able to grow in New York? I honestly thought we’d be limited to herbs only. We’ve lived in our house for almost 9 years, with an empty raised bed of dirt in my backyard. It’s about 7×4 feet. This is going to be our year to finally DO something with it! Just checked out some gardening/kid’s gardening books from the library. I live in SoCal with lots of sun, heat, and arid weather — and ants. So we’ll see what happens. I would be happy with some tomatoes and basil for a caprese salad this summer! Okay, I am in too! I would be really happy with just the herbs this year. I want my daughter to see where her food comes from (I can always explain that the other large vegetables and fruit grow from the ground like the herbs that I will hopefully not kill). We have just moved to France so if I get more ambitious I will have to navigate the local nursery with my limited French and my dictionary. Thanks for the post, it has motivated me to make this a priority! As for a garden, we started simple last year to wet our feet a little and did tomatoes, cucumbers, greens of various sorts and carrots. Oh and we managed one zucchini and a couple of green pumpkins before the frost hit (I got those started a little late). This year we are going to build/make a couple more plots and expand with some of the things that can get started now like peas, broccoli, kale, onions and who knows what else. It’s my thing to do this Saturday. We’ll all hope for goodluck! Thanks for this inspiration, Raleigh-Elizabeth. I need someone to keep my on schedule, and tell me I can do it. I realllly want a successful garden this year and this is just what I needed. You can do it! And tell us how it goes, Amy! I’m sure it’ll be great. This is one of the things I would love to achieve more than anything else – and I think that’s because of of my husband and my appalling track record of keeping house plants alive. However, we decided as we’d managed to grow a beautiful and clever girl and a gorgeous caring boy we should be a little more confident with a few bulbs and seeds! Our little boy planted some garlic just before Christmas and there are shoots… so we went for it and have just planted onions, potatoes, asparagus and rhubarb… and an apple tree. The best bit is that we’ve now transformed Sunday afternoon into ‘Gardening Club’. After church each week we all get into muddy boots and get digging and watering and record everything in our garden journal. If we grow very little there’s a million happy points just in the fun we’ve been having in just having a go! does growing lettuce in a city picker count? then yes! Creating Healthy Meals with In-House IngredientsShe's Brilliant! I’m a long time gardener, and although I like the idea of using inexpensive ice cream cones (newspaper made into cups also works), wouldn’t the cones disintegrate when watered over a length of time? 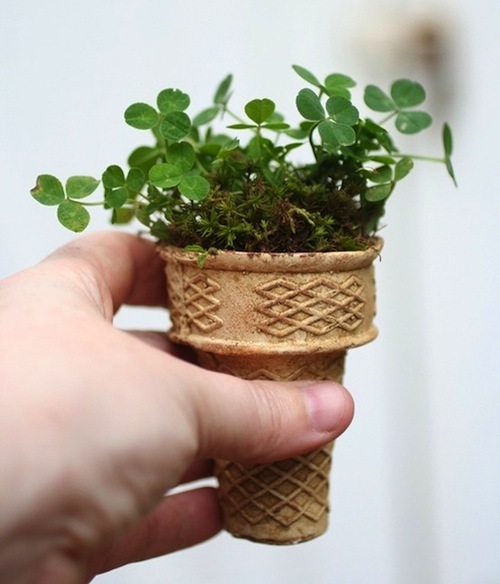 The picture of the perfectly growing plant in the Icecream cone is quite deceitful. Although a great idea, it’s a definate fail. My mom and I just spend the evening planting all of our veggies, getting them ready for transplant after memorial weekend. Everything was going according to plan until we watered them. The cones turned to mush and now we have to come up with a new plan. A waste of time and money. At least we had a lot of good laughs over it. seriously you’re ahead of Martha as she does very little of the dirty work, she has a slew of minions do it. Most ideas from her magazine and show aren’t even hers, people are paid to find them and carry out the grunt work. Martha might have been resourceful at some time but she doesn’t do it all now. Give yourself credit for researching, planting and reaping the rewards of your own garden! Kudos!! I was like one of the posters above, and frequently abandoned my backyard vegetable garden half-way through our very short growing season. But I switched to the Square Foot Gardening method, and it’s worked pretty well for me. It’s much easier to weed, and I don’t get so overwhelmed. I don’t find the garden yields quite as much as the writer of the books claims, but it does make is manageable for ADD me. Gotta laugh at that ice-cream cone! OBVIOUSLY an idea created by someone as Pinterest bait, who never actually TRIED it except with plastic plants! You know what happens when a cone sits with melted ice cream in it? It turns to goo. So what do you suppose happens to an ice cream cone when it sits with wet soil in it? It turns to goo! And then it will attract fruit flies, and mold, and all sorts of really attractive things that you REALLY want to have in your kitchen window or wherever else you are putting your plant starts this year! Egg cartons, yogurt cups, pretty much anything recycled is a much better idea, it will actually hold together until the plants grow enough to set out. Peat pots are biodegradable, and about half the price of ice cream cones also. If you want to spend the price of ice cream cones, get Cow Pots, which are made from processed and sterilized manure, and are biodegradable, and add nutrients to the soil. The cone is sporting a crop of sphagnum moss and some kind of trefoil (clover). While clover is technically edible, it isn’t really a tasty green, and does not qualify as even being edible in most gardening circles. Yeah, I’ve eaten it, when researching edible weeds, one year when we did not have the ability to get a good start on a garden, so I went hunting around to see what nature could provide for free. Chickweed was good! Clover, not so much! How do you keep the cone from getting soggy while your seedlings are growing? I’m wanting to do this but not sure is II’ve got what it takes. Do you dig a hole big enough for the bottom of the ice cream cone to go in the ground? I agree with you Stacy Hill, how do you keep the cone from getting soggy? Didn’t think about that. We’ve been growing heirloom tomatoes for quite a few years and I really love them and can eat them fresh out of the garden, still warm from the sun. A tip I got a few years back that I love to share it about planting basil by your doorways to the outside. Flies hate basil and this helps keep them from coming in when people go in and out. It really works and smells good too!! Thought I’d just share this little tip. The last garden I tried was a complete failure so I am trying again this year. I currently have broccoli and brussels growing in a starter seed thing I purchased and they were doing SO good. Can anyone tell me, at what point do I need to put them in their permanent home? Also, I was going to plant the rest of my seeds for tons of various fruits and vegetables in egg cartons. What is the best way to do that? When I bought the seed starter set, it had a lid to keep the moisture in during it’s first days, but obviously an egg carton wouldn’t. Any advice would be fantastic!! I’d like to know if they stand as well while germinating the seeds in the cones? Or are you use in a roasting pan? we lined ours up in foil baking pans…to keep them upright. Great info.-keep up the good work! I like the egg shell idea. The ice cream cone one not so much. The sugar in the cone will either mold (which will kill the roots) or create alcohol type substance when it breaks down (which will kill the roots). Other than that I think its a great idea. 101.7 The One | Get growing...indoors! How do you plant these things? How do you keep them from getting Soggy like Stacy mentioned. I like the egg shell thing too Norm.